Everyone loves an evergreen. They bring year-round interest and structure into your garden, keeping your outdoor space looking green, fresh and alive all year long. Evergreens are traditionally seen as an easy-care option, and whilst this is true to a certain extent, to bring out their true beauty and to keep your garden looking green all year, there are a few steps you’ll need to follow to give them a little bit of TLC. As with any plant, making sure you site your evergreens correctly in the first place is key. For example, it’s important to avoid areas where your evergreens will be at risk of wind damage, and too sunny a position can scald them in the summer months. If you’re thinking about re-landscaping your garden, it’s important to instruct a professional garden landscape company to create a planting plan for you and carry out the work. They can also advise on varieties which are best suited to your garden. This way, you’ll guarantee that all of your plants, not just your evergreens, get the best start to their life in your garden. Did you know that you should aim to have at least 10% of your garden planting evergreen? 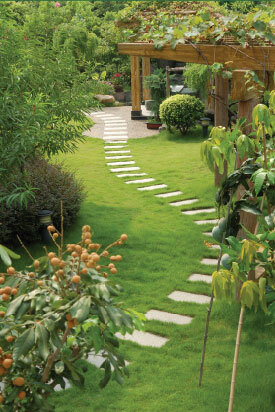 Alternatively, some people go for a full-on evergreen garden, because of the low-maintenance factor. If you opt for this, you will need to ensure that you’ve got plenty of varieties included in your garden, so as to add interest. If you’re not looking for a completely evergreen garden, then you’ll definitely want to include evergreens planted at strategic points. This could be as a backdrop to borders, or in tubs on patios. Your planting plan from your landscape garden company will detail how this will work best for your outdoor space. Evergreens require a large amount of watering, and should have at least an inch of water a week. This is especially important during the first year they are planted, and also during the summer. They really need to be given a deep water, from spring right up until the point in late autumn when the first frost falls, and therefore you may wish to instruct a professional gardening company to regularly maintain your garden. Depending on the condition of your plants and the type of soil they’re in, you may need to fertilise your evergreens regularly. It’s important to use a balanced, slow-release fertiliser which is designed specifically for evergreens. This is something that your garden landscaping company can advise on. With a little love and attention, an evergreen garden can be a lovely space to enjoy year round. If you’d like an evergreen garden created for you, or would simply like a garden which includes plenty of greenery all year, get in contact with D&G Garden World, as we can professionally bring the green fingered touch to your outdoor space.